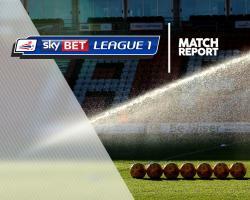 Chesterfield were relegated to Sky Bet League Two as they went down with a whimper in a 3-1 defeat at Scunthorpe. The Iron dominated the game from start to finish, controlling possession and territory to secure themselves a top-six finish. He headed into his own net after Josh Morris' corner had been flicked on at the near post by Neal Bishop. Scunthorpe added a second goal eight minutes before the break, Ivan Toney leaping like the proverbial salmon to beat goalkeeper Thorsten Stuckmann to Bishop's looping cross and nod home. Devoid of attacking ideas and seemingly reluctant to push for a route back into the game, the second period followed pretty much the same, one-sided pattern. And though Stuckmann came to the away side's rescue when denying Paddy Madden and a cracking curler from Stephen Dawson, he could not keep out another clumsy goal when Toney bagged his second in the 73rd minute. Tom Anderson headed in a consolation goal in stoppage time, but by then the Spireites' fate was sealed.